Clay Pipe Music: The Hardy Tree - Through Passages of Time. Available Now. 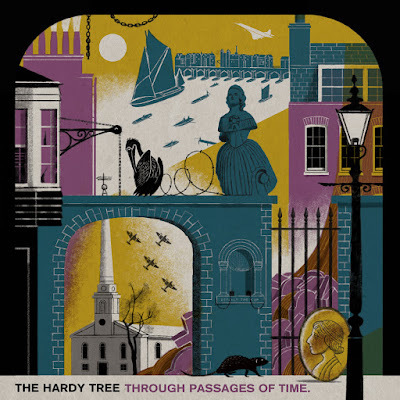 The Hardy Tree - Through Passages of Time. Available Now. The Hardy Tree – Through Passages of Time. Release date 2nd Dec 2016. 12" coloured blue vinyl with reverse board cover. 500 hand numbered copies. 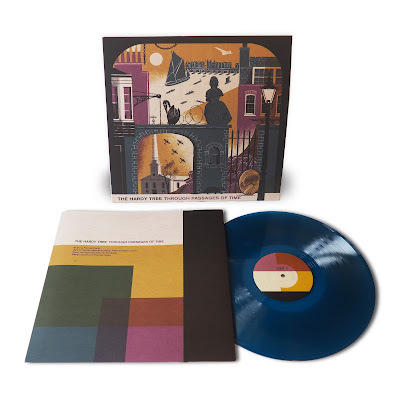 There will be a re-press, please sign up to the mailing list. I will make pre-orders available ASAP. The Hardy Tree is the musical project of Clay Pipe Music's founder Frances Castle, her first LP ' The Fields Lie Sleeping Underneath' was the initial release on the label over five years ago. Through Passages of Time soundtracks buildings and areas of London that no longer exist. Small places stumbled upon by accident, traced on maps, and illustrated in Georgian prints. Frequently visited pubs that have been rebuilt and renamed, the ship breakers yard decorated with wooden figureheads at Baltic Wharf, or the Thames Watermen living in the shadow of the Hawksmoor designed church at Horselydown. Lost places re-imagined and brought to life using clusters of sequenced Moogs, off Kilter electronics, vibes, and Mellotron - capturing the essence of the dark city and its more bucolic outer suburbs. This is a plaint to an older stranger London that is quickly becoming priced out and forgotten. Look carefully and clues to the ancient past can still be found.